May the stars carry your sadness away, May the flowers fill your heart with beauty, May hope forever wipe away your tears, And, above all, may silence make you strong. 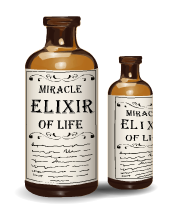 Snake oil salesmen of yore would tout miracle elixirs promised to cure any and every malady afflicting man. The same spirit of salesmanship has continued on up to the present day. Though the message is subtler, it is exponentially more pervasive. There are drugs to take, products to buy, social networks to join, and things “are getting better all the time” but this never lives up to the actual metrics that show us, by many measures, losing our health, happiness and sanity while the environment deteriorates. To compound things, this process often acts as a negative feedback loop. That is, the worse things get, the more we, as a society, delve into the very things that helped get us here in the first place. Conspicuous consumption feeds on low esteem offering only the most ephemeral of escapes while enabling the next fix and degrading our happiness. Taking drugs, legal or otherwise, habituates us to drugs, leading to higher dosages and more drugs to alleviate the effects of the original ones, and so on. Social media tends to create loneliness and feelings of isolation which might lead us to more social media to fill the void. Everything from obesity to ADD can at least be partially explained by our entrapment in this vortex. But as the ancients have always known, the panacea was right in front of our faces all along. Simply look out your window into the natural world and the healing has begun already, quite literally. Even in the starkest urban concrete jungle, it has been shown the infusing natural sights and sounds into the unhealthful environment starts to reverse its ill effects. Trails will save your life. The very act of gathering in a group and accomplishing a goal is life affirming and extending. They climb up the hill, stimulating cardiovascular health, muscular endurance, stabilizing metabolism. They breathe in a rich, salubrious air given off by plants. Oxygen may just be the base of the potion. Studies have begun to show that certain common plants and trees give off air enriched with cancer fighting, immunity boosting substances. Cortisol levels and blood pressure plummets. Their stress levels dive as their mind reaches a meditative state. If they’re lucky, the act of biking (as can happen with running, skiing or any intensive physical or mental activity) itself induces a state of flow, the highest mind state possible in which you achieve perfect connection with your environment, in short, bliss. This deep enjoyment will almost involuntarily bring them back again and again, compounding the benefits, energizing every cell in their body. Every outing reduces their anxiety, increases their smarts, alleviates depression, increases creativity; time spent in nature has been shown to be as effective as a dose of ritalin for those diagnosed with ADD, probably even more so. If that weren’t enough, it makes them kinder, more compassionate, and trusting as a simple consequence of their environment. If the root causes of over consumption are not only cut but reversed, it stands to reason that the behavior would slow or cease. The felt need to fill life with diversions that offer poor facsimiles to real experience would plummet. A place that makes a person so happy, healthful and connected would also engender a bond, a desire to protect it and everything that touches it. That caring, one could imagine,would spawn the sort of lower impact development that would protect it. Malls and sprawl stand no chance against people who truly have grown to love their community. This concrete sense of place, in direct opposition to the alienating sense of “no place” that sprawling, homogenous mallscape encourages, would in turn lead to a greater increase in activities that honor that place. Patronizing local businesses, eating local foods,and a whole array of localisms would grow along with the respect for place. This is what has been quietly happening in Vermont for years. The community has had the foresight to love the land like almost nowhere else in the US and as a result localism has arisen (or never declined in the first place). Nature itself would pay back this back in spades, taking in some of our excess CO2, providing clean water, preventing erosion, regulating climate, keeping the balance of nature intact, maintaining the homeostasis that has spawned and proliferated life on earth. We’re not saying trails, as they represent our reconnection with nature, will save the world, errr...the human world. 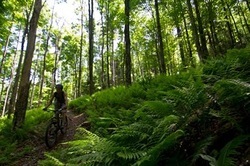 But we are making the brash claim that trails will save your life if you unplug, reconnect, turn off the ignition and simply let them. Remember the place you went as a child, your own forest hideaway, where you climbed trees, skipped across rocks, daydreamed by a waterfall, chased butterflies, spotted deer, skinned your knee, ran amok down twisty paths, got lost and then barely made it home before dark? That place still exists.